Panjim Footballers surprised Guardian Angel Sports Club with a 2-0 win in the Goa Professional League match played at Duler Stadium yesterday. Today’s victory helped Panjim to move up to the 7th position with nine points from nine matches, whereas Angels remained on the 3rd position. Before this match, Angels were in the fantastic form as they were standing 3rd with 14 points in the league table. They had defeated Calangute Association 3-0 in their last match, whereas, Panjim were struggling at the bottom half of the table with just six points. The capital city side that lost to FC Goa in the last match made few changes to their side as Pisco Moura and Clive Miranda were back in the starting XI for Panjim, whereas, Angels made no changes to their winning combination from the last match. It was equally contested first half where both the team tried to keep the ball for first 30 minutes, as a result, the match was restricted to midfield play. However, Angles were the more potent side in the entire session. They had the best chance of the match in the 34th minutes when Clifton Dias found Nigerian striker Yakubu Mohammed with just keeper to beat but instead of just directing in the goal, the forward shot over the crossbar. He had another opportunity in the 38th minutes to put his side ahead but like the last time, he chose to bang the ball from close which went sky-high, off Perryson Rebelo’s cross from the right. Panjim had only once close chance in the first half when Steven Pinto’s corner was brilliantly directed towards the goal by Clive with a header but Angles U-20 midfielder Louie Noronha came to rescue his side with a goal-line clearance. 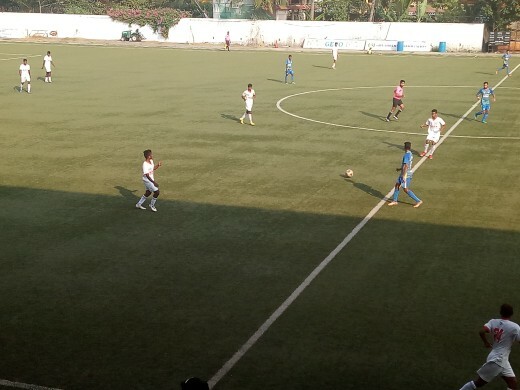 Unlike the first half, the Capital City side started brightly in the second session as they came up with continues attacks on the rivals and finally managed to break the deadlock in the 50th minutes when Prisco played an excellent through pass to Velton D’Souza in the box, who calmly placed the ball home to take Panjim into the lead. Down by a goal, Angels coach Vaz made two quick changes, bringing in foreign strike force Abel Hammond and midfielder Rayman Fernandes to get back in the track but it was Panjim who once again came close to scoring in the 69th minutes when Clifton Fernandes made a short pass to Akeraj Martins in the box but the striker shot wide. However, four minutes later, Panjim doubled their lead through Mahesh Kumar. The midfielder made no mistake to shot past Angels’ keeper Ram Sroop after getting hold of the perfect through pass from Clifton, to make it 2-0 for his side. Angels tried hard to get back into the match but Panjim defender stood tall until the full-time whistle to earn full three points from the match.